Have you heard of Sarcopenic Obesity? 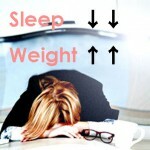 Confusing it with metabolic syndrome common amongst obese people, will leave your frail and unable to walk as you age. Read how this doesn't have to be you. Save yourself! Japan with more than a quarter of its population over the age of 65 has been recognized as the fastest aging country in the world. Despite this fact, Japanese people have the lowest rate of obesity in the world. That only means one thing, less elderly men and women suffering from sarcopenic obesity. If you are young and are looking for ways to better cope with aging, then this Slism is right for you. Not only by reading it do you become more diet smart, you have what you need to make more informed decisions regarding your diet. Here we will discuss how you can ensure that you will not be bothered by sarcopenia in old age. Before that happens, let's discuss what is means to gain waist and grossly lose muscle mass at the same time. If you are pushing 30 and your BMI is at an all-time high, it is time to get off the couch and start hitting the gym to take on your greatest enemy. Obesity is a health condition characterized by anobtuse body fat to weight ratio. It is considered an emerging global issue as more and more people around the world become obese. Think about it. You are in your late 30s, going to the gym, staying active; but what's on your mind is why is it that no matter how much you try to push vitality to the limits, you can't stop feeling like your body is like a fading leaf. Why can't I be the way I was in my prime? Sarcopenia is medical condition in which a person experiences loss in skeletal muscle when progressing toward old age, characterized by the erosion of muscles on your body through aging. Imagine going to the hospital expecting routine treatment, only to realize something is wrong, waking up one day not quite able to walk. Why would cause this sort of thing to happen in the first place? Sarcopenic obesity is the cross product of both: obesity and sarcopenia, i.e. a condition in which you put on body fat while losing muscle mass as you age. It is often associated with overweight older patients who have been rendered bedridden after receiving treatments of another disease. How is this different from other types of obesity? Let's compare sarcopenic obesity to the more prominently health hazardous metabolic syndrome. For one thing, three is a drastic difference in the affect it may have on developing certain lifestyle diseases later in life. Here is a table mapping out the specific differences between sarcopenic obesity and metabolic syndrome related obesity. Both medical conditions are unarguably something that you don't want to keep up in your late 40s. However, these conditions are not only inherent to people in their middle ages. Recently, even for young people climbing out of their prime, losing muscle mass and having metabolic syndrome develop into sarcopenic obesity is an occurring problem in which prevention needs to be taken more seriously. Simply speaking, people are not getting as much exercise as they use to. Men are especially susceptible to fat around their waist due to a lack of physical activity. When was the last time you tool a brisk walk in the park? Women however are more likely to gain weight in other areas such as the area below their waist and their upper arms. When thinking about going on a diet, what comes to mind more so than exercising is adopting a diet, usually requiring dietary constraints such as eating less or eating only curtain kinds of foods. It turns out that this sort of dieting approach, not exercising, relying solely on limiting your diet only invites loss of muscle mass, increasing the chances that your condition will develop into sarcopenic obesity.This is one reason that you may want to stay away from fad diets. Diets that make you focus too much on you weight, such as the ever popular How to lose 10 pounds fast variety are not as promising as they seem, and risk possible muscle loss while fat remains unchanged that make you ask the question, "Is there something to gain from losing weight, even though your body fat percentage increases?" Deterioration of skeletal muscle mass is an unavoidable effect of the natural aging process that starts as early as age 25. However, that doesn't mean there are not remedies, regular exercise focused on increasing muscle mass, that people aren't trying. At a time when you should be focusing on gaining a moderate amount of muscle mass, not exercising, focusing too much on calories (obtuse calorie counting), also beckons loss in muscle mass and eventually the development of late symptoms of sarcopenia. When muscle mass begins to fade around age 25, this is a time when you are most susceptible to gaining weight. In the mist of this, diets that don't require exercise relying solely on dietary restrictions to lose weight encourage loss of muscle ultimately effecting how well you age. Can you from a sitting position on a chair stand up on one foot? Not being able to do this (stand on one foot) is a sure indicator that you lack muscle mass if you are under 30. (If you are in your 20s, this is something that you need to work towards being able to do) If you are around 30 and can't stand on one foot, the probability that you won't be able to stand is not unlikely. Failure to prevent loss of muscle mass doesn't end with obesity; but increases the chance of being becoming bedridden at an old age. In particular, resistance exercises such as squats and push-ups are recommended because not only do these exercise help train muscular strength, they help build strength to bodyweight awareness crucial to detecting symptom of sarcopenia early on. Protein is a macronutrient essential for the maintenance and construction (building) of muscle mass in your body. Inherent to protein is the quality which is best characterized by the concentration of amino acids in it. That is why consuming proteins with high essential amino acid concentration is a dieting must that should not be overlooked. By taking the way you usually go about dieting and exercise, incorporating these two very important points, not only do you have what you need to prevent sarcopenia, you effectively boost your metabolism. 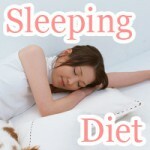 This in effect, makes it easy to burn off extra calories, which improves the chances of your diet success. Lifting heavier than you are used to is a sure way to get hurt, getting put on the bench. When lifting lower the bar, lifting at most only a portion of what you can actually do. This not only makes sure that there is no way you get hurt; it makes you more down to earth, a quality than is undeniably likable no matter who you are. There is some truth in the statement, "If you are going to do something, you better had be looking good." Unfortunately, this is not always the case in all exercises. Beyond funny you look when working out, what is most important is making sure you respect your body's mechanics by applying good form isolating muscle groups that you should be working while preventing the chances that you get injured. After resistance training, the muscles you used need time to repair. More so, in order to encourage healthy muscle growth, giving your body time to recover is compulsory to the routine of resistance training. Being generous towards your body, overcompensating with periods of rest is the key to stable muscle growth. 3 Low-calorie health foods with an amino acid score of 100. Now that's high-quality protein! Chicken eggs are an affordable and to today's standards, an endless supply of protein. They contain just all the vitamins and minerals your body needs with the exception of vitamin C, making them a life source for people looking to balance their nutrition. Chicken breast can be found in many areas of diet folklore, including the legendary Caesar's Salad. Next to the egg in which it comes from, it serves as a nutritious standalone when you are having trouble figuring out what to eat. Not only does it have an excellent amino balance, it is an excellent source of B vitamins that dieters love. Scad is rich in DHA and EPA known to help lower neutral fat; and contain ample amounts of iron that many dieters seam to miss. It is also said to be good for the prevention of anemia, which means more oxygen flowing through your bloodstream. What is Sarcopenic Obesity (SO)? 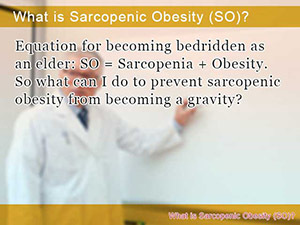 Equation for becoming bedridden as an elder: SO = Sarcopenia + Obesity. So what can I do to prevent sarcopenic obesity from becoming a gravity? Don't say SO about your diet? 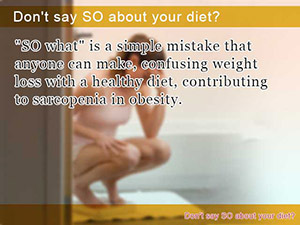 "SO what" is a simple mistake that anyone can make, confusing weight loss with a healthy diet, contributing to sarcopenia in obesity. So what's in store for me? 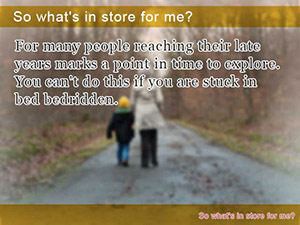 For many people reaching their late years marks a point in time to explore. You can't do this if you are stuck in bed bedridden.